Frozen turkey cuts should be thawed in the refrigerator or by using the cold water method, and when thawed, cooked within 48 hours. While turkey cuts may be thawed using a microwave, it should be done with care and the thawed meat must be cooked immediately following thawing. 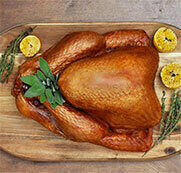 For information on thawing a whole turkey, visit our Whole Turkey HOW TOs section. This method of thawing turkey cuts is the safest, as it keeps the meat cold until it is completely defrosted. Place tray pack on a tray on a bottom shelf in the refrigerator. Keep the turkey cut in its tray pack. In a container, cover the tray pack completely with cold water. Once thawed, keep your turkey meat refrigerated and cook within 48 hours.